Sometimes, well perhaps a lot, I paint. 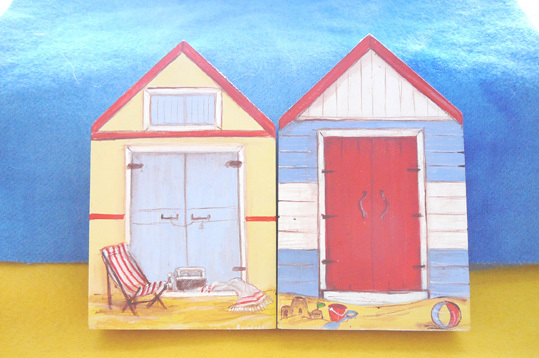 For many years, though less so now, I painted miniature houses on wood shapes . The huts depicted were inspired from trips to Victoria. These seemed just right to share here at this time as it is summer holiday season. For many families in Australia Christmas and the beach are a family tradition as groups collect together for picnics or B-B-Q with prawns and cold beer a popular choice on the menu. What brought this particular project to mind was having to go to the coast on Christmas Day. A very joyful trip as my daughters were flying in and we made a slight detour to look at the sea, frothing and raging after a recent cyclone. In spite of the dangerous surf the beaches were still busy. It had crossed my mind to plan a beach picnic but the weather was erratic and storms forecast so we played safe and decided to celebrate at home. The task of decorating the tree for many years has been undertaken by my daughters, but this year it fell to me. To be honest a tad apprehensive as they have such skill. What happened this year is that, as I tentatively placed red and silver baubles on the tree, this act became a linking to my European roots. On Christmas Eve, (1 a.m in this instance), the mother decorates the tree. The children then view it in wonder and delightful surprise, which is how it worked for us. It has been a time enjoying simple pleasures such as cooking together, board games and reading, lots of laughter and memories. Before the girls leave we will visit the beach. Today everyone is adjusting to the humidity and heat, plus the busy year has also impacted on everyone, so naps seem to be the priority. The blue sky is now heavy and grey with a storm building up. So Christmas has come and gone, as always in a flash. Summer seems well entrenched, but it will pass all too quickly. I guess these little huts serve as reminders of summers past and summers to come.